Hiking Backpacks are an indispensable part of any hiking expedition that you undertake. These convenient backpacks allow you to neatly organize all your equipment and necessities into one little sack that you can easily carry on your back. Now there are several types of hiking backpacks that serve different purposes. 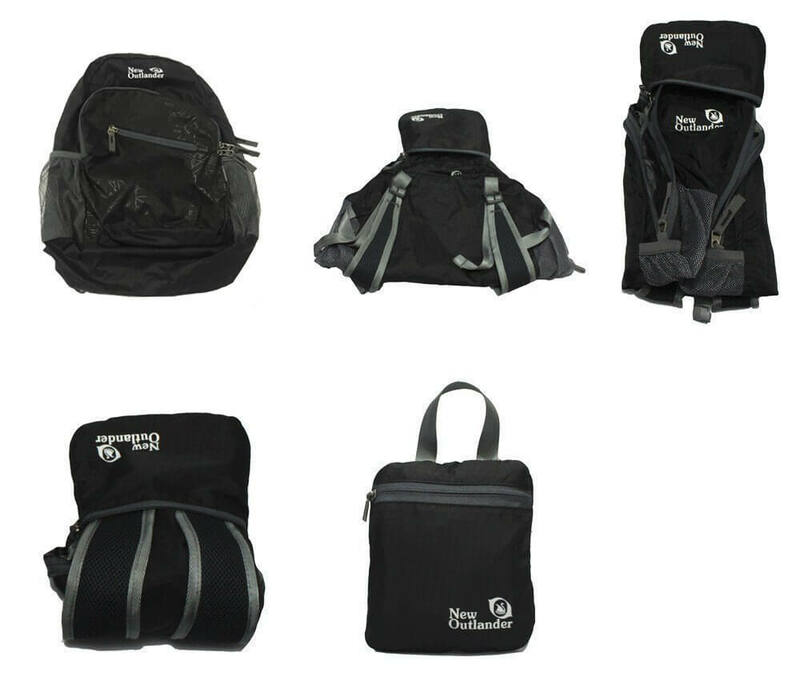 We have full sized expedition packs that are designed for treks or expeditions that last for multiple days. Then there are hiking daypacks that are much smaller and are made for smaller treks that last a day or less. This durable backpack by Outlander is a hiking daypack that is meant for short adventure trips. So in case you’re planning a weekend trek through the serene woods or ahike across the rolling hills, you’re going to need a good quality hiking daypack. The Outlander 20L/33L Hiking Daypack is one of the best options for you to choose from as it offers great value for the money you invest. Packed with all sorts of convenient features and crafted from a strong high quality material, this backpack is sure to take care of all your storage needs. Outlander is one of the leading manufacturers of travel accessories especially hiking gear. They have made a name for themselves in the field and hence is a brand that we can trust. This daypack by Outlander is a versatile, ultra-light and reliable backpack that comes at a throwaway price. It has a sleek and stylish look and is for all those minimalists who strive to keep things light and comfortable. This go-anywhere backpack is suitable for everyday use such as school, college and for short day-trips. The Outlander 20/33L has been listed on several websites as the best travel daypack. It is extremely durable thanks to high quality rip and water resistant ripstop nylon fabric. Ripstop nylon has recently gained popularity due to its puncture resistance and waterproofing properties that make it highly suitable as a material for making hiking backpacks. This fabric provides immense strength and long lasting performance to these backpacks and they are sure to last you a very long time if taken well care of. This backpack also features a durable 2-way abrasion resistant SBS metal zippers on both sides and across the backpack. These SBS zippers are corrosion resistant and do not rust easily even when subjected to wet environments. Moreover, this backpack has bar tacking at numerous stress points which help to even out the stress equally throughout the pack and increase it longevity. The lightweight nature of the Outlander 20/33L backpack is another great feature that is especially preferred by lightweight backpackers. The 20L version weighs only 0.46 pounds while the 33L weighs only 0.5 pounds. Lightweight backpacks are great for day hikes as they allow you to store more stuff without having to worry about things getting too heavy. For us lightweight backpackers, every gram counts. As far as the capacity of these packs are concerned, there are two options for you to pick. There is a 20L version which is more suitable for day to day activities and general short distance travel. It is great for school, college and for pretty much any regular outdoor activity that requires you to carry stuff around. The 33L version is better suited for hikes and small adventures because it allows you to store a significantly higher amount of items in your backpack. Both these versions have identical features and so the one you choose should depend on how much stuff you plan to carry around. One of the best features of this Outlander backpack is the fold ability. You can easily fold this backpack into the zippered inner pockets then pack it into your suitcase and use it later as an additional storage. It will also help you avoid extra baggage charges at airports. This backpack by Outlander scores a high when it comes to style. It features a classic shape and has multiple pockets for storage and organization. Apart from the roomy main compartment which you can use to store the bulkier items, there are two additional front zipper pockets and one internal zipper security pocket. The internal security pockets can be used to store valuables and other fragile stuff. It also has two side pockets for holding water bottles and even come with carabiner clips for you to attach things to the pack. So if you are looking to buy a backpack for short distance hiking, this Outlander Lightweight backpack is definitely worth your consideration. It is ultra-light, ultra-durable and ultra-comfortable – pretty much everything you can expect out of a backpack. Moreover, Outlander provides lifetime warranty on this backpack which speaks volumes about the quality of the product. Overall, a great backpack for anyone who likes to keep things simple and light. Hiking as an outdoor activity has gained immense popularity over the last decade. People all over the world are planning adventurous trips to far off places to experience the thrills of nature. If you are one of those people then you’ve come to the right place. Hiking requires quite a lot of equipment that you must carry around to ensure your safety while you are on the trail. These include trekking poles, sleeping bags, tents and a ton of other tools and necessities that are required for your well-being. Carrying all of these around can be a huge hassle and ordinary backpacks are nowhere near enough to fit all of the stuff you’ll be needing during a trek. This is where the need for a special hiking daypack such as the Montem Diadema 18L Daypack arises. Hiking daypacks are specially designed to pack in all necessary equipment into one and keep them in an organized manner. These hiking backpacks are also made of special materials that provide additional durability to make sure they survive the wild. Montem is a well-known brand that has made a mark in the field of trekking gear over the past few years. It has established itself as a trusted manufacturer of hiking gear and they have lived up to people’s expectations consistently. The Diadema 18L Daypack by Montem is yet another quality product by the company. 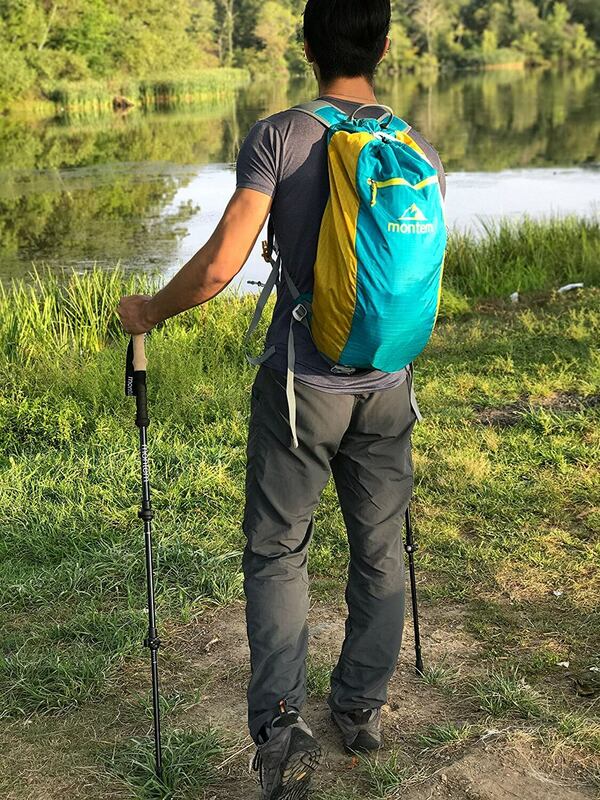 If you’re new to the world of hiking and are looking for a compact and lightweight hiking backpack for short distance treks, then this is the perfect choice. The Diadema 18L Daypack is made of 100% ripstop nylon which is one of the best suited materials for hiking backpacks. As the name suggests “ripstop” nylon can take a beating and still not tear. It is a puncture resistant material that is extremely durable and long lasting. If these backpacks are properly maintained, they will last you a lifetime. A high quality durable material is something that should be must for any outdoor daypack because ordinary materials are quite fragile and are sure to tear. Additionally, ripstop nylon also has waterproofing properties that make it highly suitable for outdoor activities. Moving on to the weight of this daypack by Montem, it’s fair to say that this backpack is one of the lightest in the market. Weighing at only 4oz, you will be able to take this to every adventure, journey or even use it for general everyday travel. Personally, the weight of the backpack does not matter much to me since I do not carry around too much equipment for short day hikes. But if you’re going to need a lot of equipment then you should definitely look for a lightweight backpack. This backpack by Montem is an 18L daypack which is enough space for you to store everything that you can possibly need on a short day trip. Remember, this backpack is not meant for long distance treks that take more than a day. The 18L volume of this backpack will let you store all your basic gear and other stuff such as rain jackets, first aid kits, headlamp, camera, food and water etc. You can even use this for your daily travels as they aren’t too bulky and can store a lot of stuff. The Diadema 18L daypack features an internal hydration sleeve which is a must for summer hikes and warm climates. You can use any 1.5L – 3L hydration pack with this backpack. The hydration sleeve more than makes up for the absence of an external water bottle hostler. As far as the durability of the Montem Diadema 18L daypack is concerned, it is one of the sturdiest backpacks that you will find in the market at this price range. I’ve tested the Diadema 18L out on a few camping trips where it has been subjected to some pretty rough conditions and it came out without a scratch. But having said that, it is quite hard to ascertain the durability of any backpack during short term use. The only foolproof way of knowing how sturdy a backpack is, is to use it for years and years until It eventually breaks down. However, it is assured that the ripstop nylon used to make this backpack will ensure it lasts for a long time. Overall, this hiking daypack by Montem is one of the most value for money backpacks available out in the market. This is especially great if you’re looking to use this on short camping or hiking treks. The lightweight combined with lots space and durability is great for day-to-day outdoor use. The price of the Diadema 18L is quite modest as compared to backpacks by other brands that have similar specifications. So if you’re looking to buy yourself a quality hiking daypack, you should definitely consider this one.